A Pub favorite! Served with Ranch Dressing. A flavor for every sports fan! 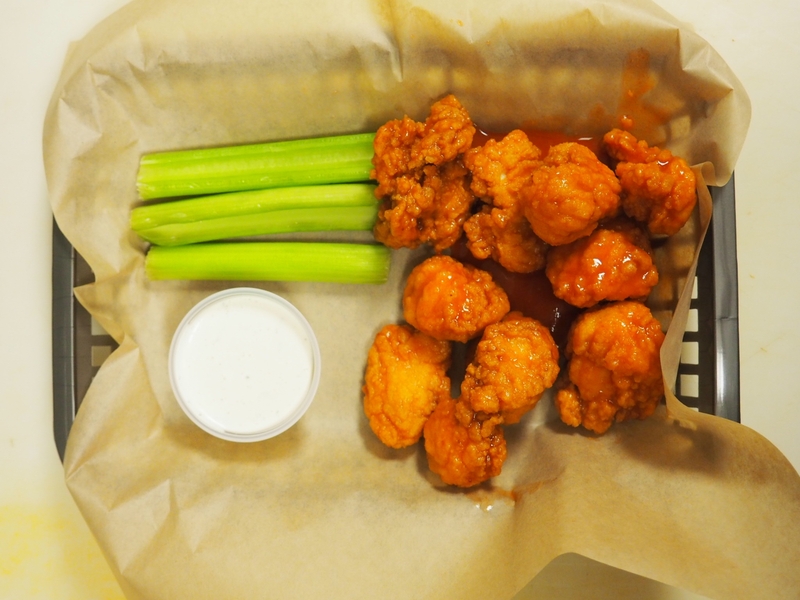 Each order comes with our homemade Bleu Cheese or Ranch Dressing and Celery Sticks. A flavor for every sports fan! Over a half pound of breaded tender Chicken Breast. Each order comes with our homemade Bleu Cheese or Ranch Dressing and Celery Sticks. 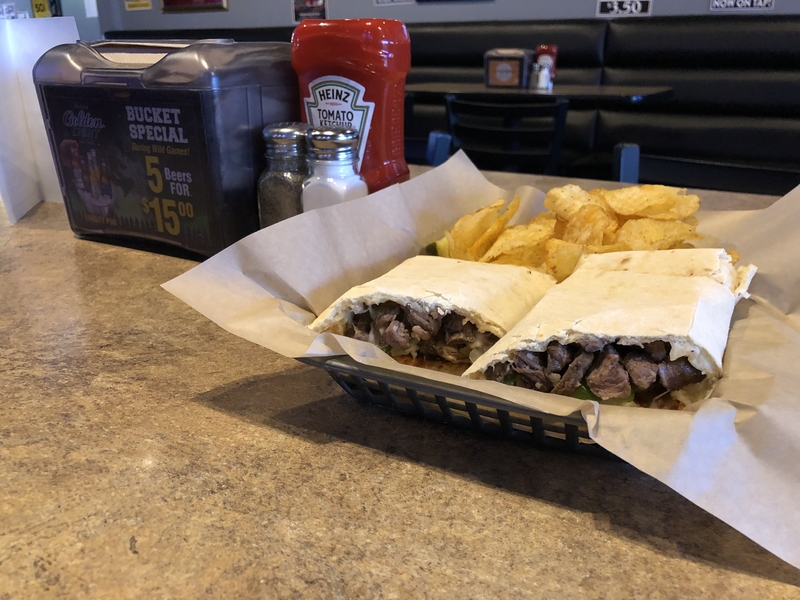 Served with our famous homemade flatbread. Made on our famous flatbread with Mozzarella and Cheddar Cheese, Onions and Peppers. Served with a side of Salsa and Sour Cream. Your choice of Ranch, BBQ or Honey Mustard. 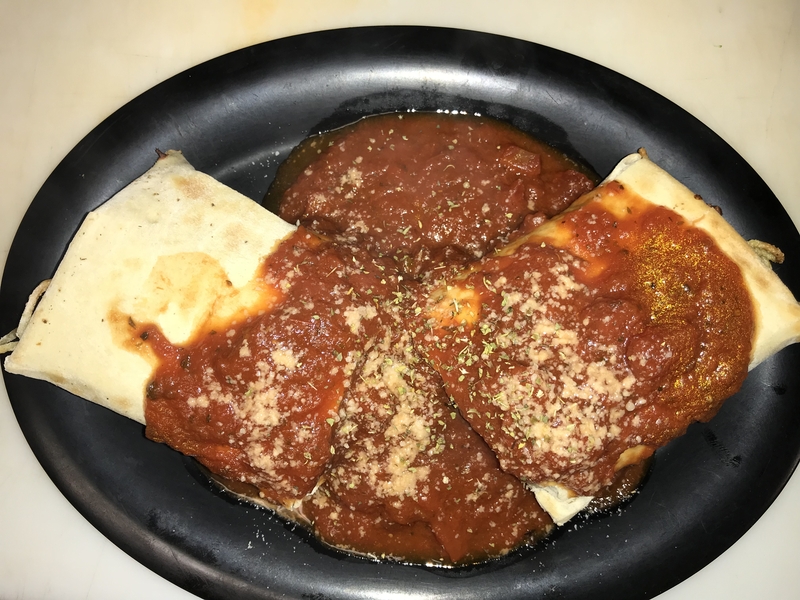 Meatballs, Mozzarella and Marinara wrapped in our famous flatbread. Served with a side of Marinara. Pepperoni, Mozzarella Cheese and Pizza Sauce wrapped in our famous flatbread. Served with a side of ranch. Made from our homemade dough. topped with garlic butter and loaded with Mozzarella and Cheddar Cheese. Served with Marinara Sauce. 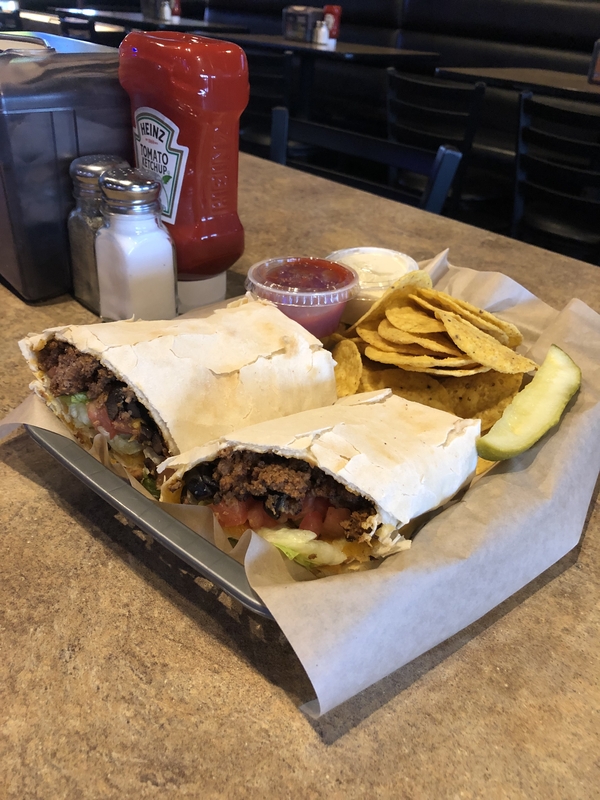 Piled high Corn Chips topped with Creamy Queso Blanco, Choice of Beef or Chicken, Jalapeño Peppers, Onions, Black Olives, Lettuce and Tomatoes. Served with a side of Salsa and Sour Cream. Creamy Buffalo Chicken Dip topped with Bleu Cheese and Celery. Served with our homemade flatbread. Over a Half Pound of Fries topped with Smoked Pulled Pork, Queso Blanco, BBQ Sauce, Onions and Jalapeño. Homemade hot and fresh to order! A unique rolled sandwich filled with lean meats, vegetables and/or cheese baked in our famous white dough. All Paninos are served with your choice of Kettle Chips, French Fries or Tator Tots. Add Sweet Potato Fries for $1.50. Tender Steak Strips, Fresh Mushrooms, Onions, Bells Peppers with Mozzarella/Provolone Cheese blend. Spaghetti Noodles, Mozzarella/Provolone Cheese Blend, Choice of Meatballs or Breaded Chicken Breast. Served with a side of Marinara and Parmesan Cheese. Classic Corned Beef and Sourkraut topped with Mozzarella/Provolone Cheese Blend. Your choice of Thousand Island or Spicy Mustard. Your choice of Tender Chicken or Turkey, Mozzarella/Provolone Cheese Blend, Fresh Lettuce and Tomatoes, and Ranch Dressing. Loaded with Roast Beef, Ham, Chicken, Mozzarella/Provolone Blend and dripping with BBQ Sauce. Seasoned Chicken, Cheddar Cheese. Black Olives, Fresh Lettuce and Tomatoes. Served with Sour Cream and Salsa. Seasoned Beef, Cheddar Cheese, Black Olives, Fresh Lettuce and Tomatoes. Served with Sour Cream and Salsa. A Luau in Marshall! Ham, Onions, Bell Peppers, Pineapple, Mozzarella/Provolone Blend and Honey Mustard. Once you try it you'll be hooked! Tender Chicken, Mozzarella & Provolone blend, and Celery. 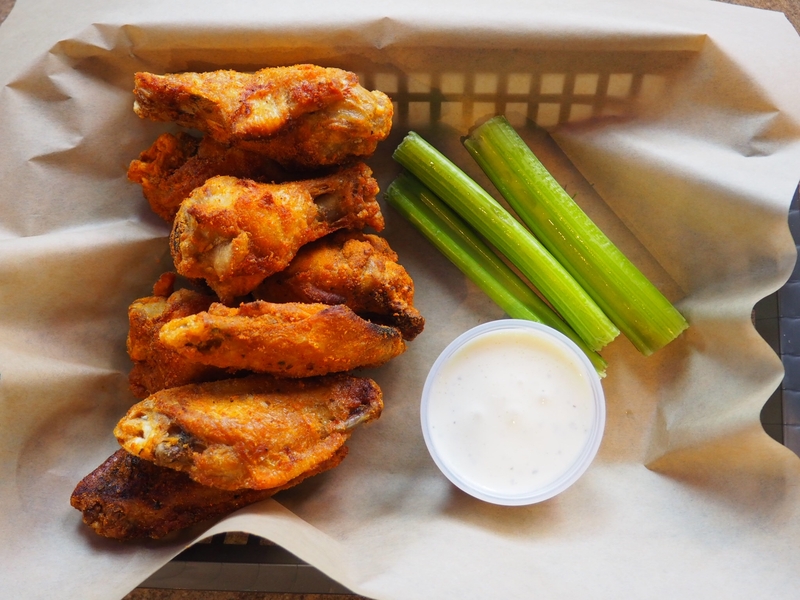 Your choice of any of our 12+ wing sauces with either Ranch or Bleu Cheese Dressing. Chicken, Ham, Broccoli, Mozzarella & Provolone Blend, Cheddar and Extra Innings' Homemade Bleu Cheese Dressing. Loaded with Turkey, Ham, Bacon, Cheddar, Broccoli Florets, Crisp Lettuce, Tomatoes and Mayo. Smoked Pulled Pork, Ham, Mozzarella & Provolone Blend, Pickles and Spicy Mustard. Tender Steak Strips, Loaded with Swiss, Mozzarella & Cheddar Cheese, and Crisp Lettuce. Seasoned Chicken with Onions, Bell Peppers, cheddar Cheese, Lettuce and Tomatoes. Served with a side of Sour Cream and Salsa. Seasoned Steak with Onions, Bell Peppers, cheddar Cheese, Lettuce and Tomatoes. Served with a side of Sour Cream and Salsa. Italian Sausage, Pepperoni, Mozzarella & Provolone Cheese, Onions, Bell Peppers, Mushrooms, Tomatoes, Lettuce and Italian Dressing. A Mustang Favorite! Chicken, Bacon, Cheddar Cheese, Onions, Bell Peppers and Lettuce with Extra Innings' own Mustang Sauce. A Mustang Favorite! Tender Steak, Bacon, Cheddar, Onions, Bell Peppers and Lettuce with Extra Innings' own Mustang Sauce. Tender Chicken, Swiss, Mozzarella and Parmesan Cheese, Crisp Romaine Lettuce, Tomatoes and Caesar Dressing. Fettuccine Noodles and Mozzarella Cheese served with a side of Alfredo Sauce. Create your own Mad Panino! Up to 5 toppings included in price. Additional toppings extra. We improved our first Rice Bowl recipe! Now with Cilantro Lime Rice, Seasoned Black Beans, Lettuce, Tomatoes & NEW Creamy Queso Blanco! Served with sides of Sour Cream & Salsa. 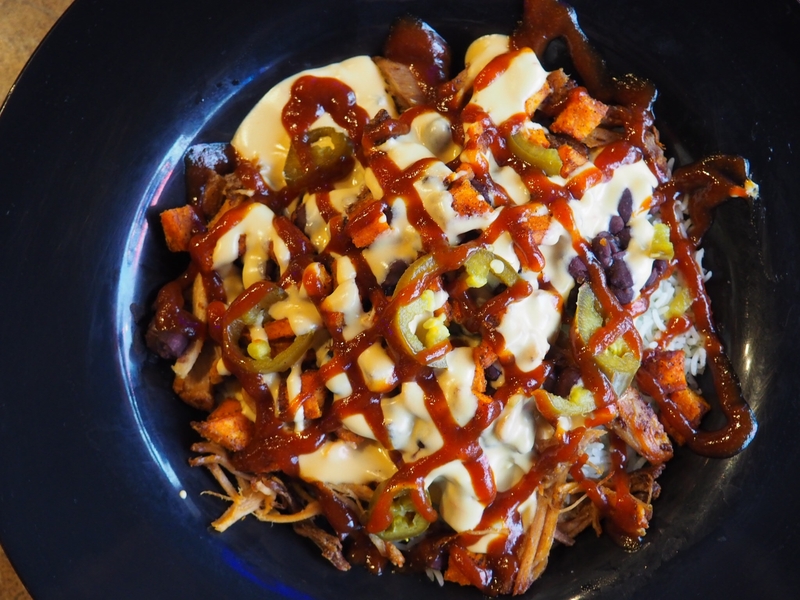 Rice, Seasoned Black Beans, Diced & Fried Sweet Potatoes, Jalapeños, Creamy Queso Blanco & BBQ Sauce. 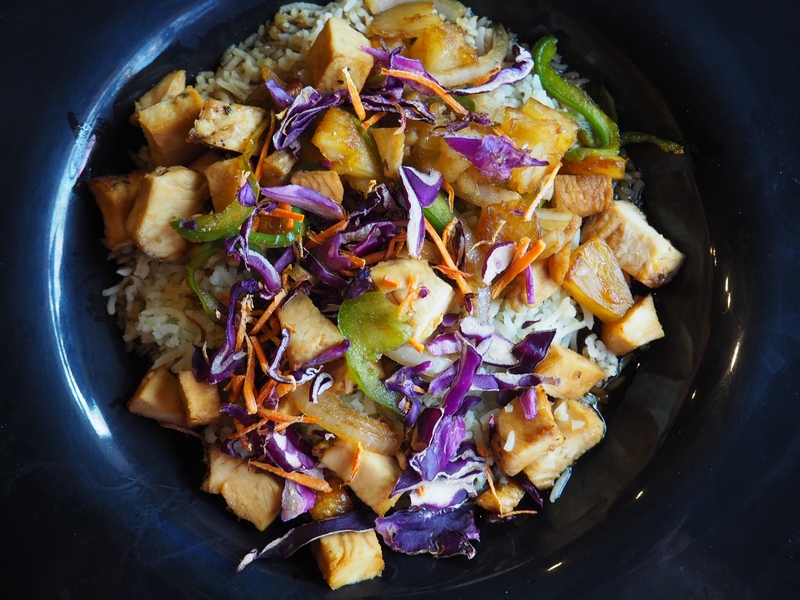 Rice, Bell Peppers, Carrots, Cabbage, Onions, Pineapples & Teriyaki Sauce. When we say "Homemade" we mean it! Our pizza is made from the same famous dough that we use to make our Paninos! 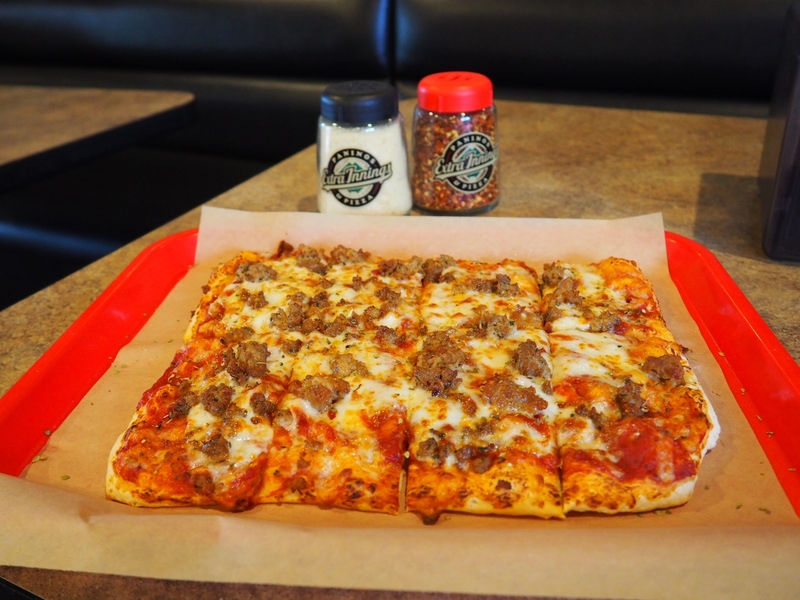 Choose our Classic Cracker or Hand-Tossed Crust! Need Ranch or Extra Sauce? Everyone loves our Ranch! Find your Dressings here! Love the Ranch? Large Ranch in here! Looking for Queso, Wing Sauce, Christy Sauce? Here's your place! Fresh Lettuce, Broccoli, Tomato and Parmesan Cheese with your choice of Dressing. Romaine Lettuce, Homemade Croutons, Tomatoes and Parmesan Cheese. Served with a side of Creamy Caesar Dressing. Add Chicken for $2.00. Romaine Lettuce, Steak, Roma Tomatoes, Onions, Bleu Cheese Crumbles and Balsamic Vinaigrette Dressing. 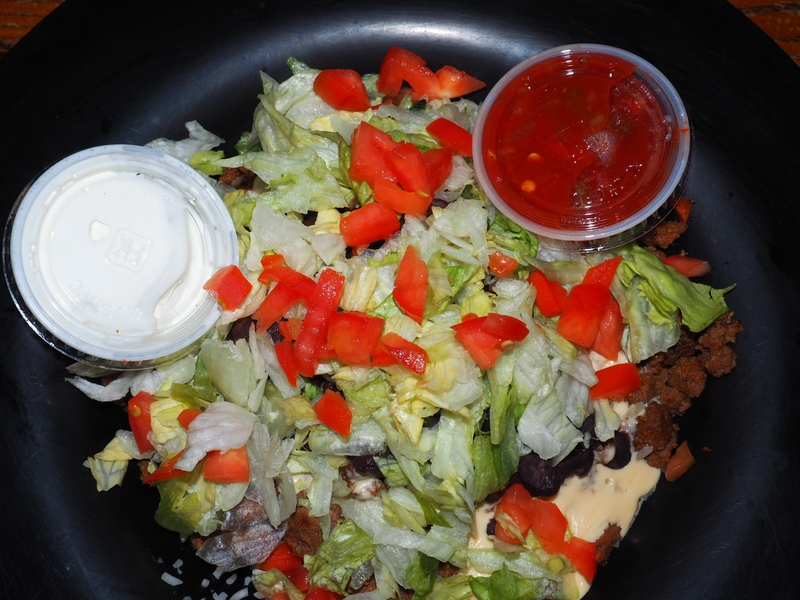 Lettuce, Seasoned Beef or Chicken, Tortilla Chips, Cheddar Cheese, Black Olives and Tomatoes. Served with Sour Cream and Salsa. Julienne Strips of Turkey, Roast Beef, Ham, Swiss Cheese, Onions and Roma Tomatoes. Served with your choice of dressing. Turn your favorite Panino into a salad! Bring the Kids something good! A double order of our huge Nacho Grande! Your choice of Beef or Chicken. Two Dozen Jumbo Wings; choose from any of our sauces or rubs!